This recipe has been updated as of July 2017 ~ same great flavors, just a few minor tweaks & new photos. 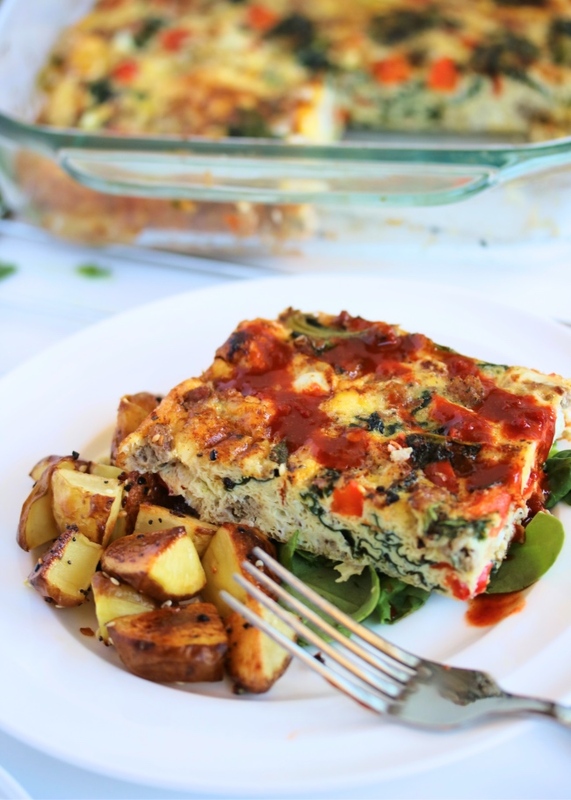 I love all of your great feedback on this breakfast bake, and have made it about a million times now myself! I love waking up and sharing breakfast with my family, especially on the rare occasion where we're all at home to enjoy each other's company. This dish is a great way to bring everyone together, without spending all your time in the kitchen. If you want to prepare this dish the night before, simply cover the baking dish and refrigerate until morning. Then go ahead & bake when you're ready! This makes it perfect for the holidays or any occasion where you have guests over~ and would prefer to spend your morning relaxing with loved ones instead of hovering over a stovetop. This dish is so colorful, & has great simple flavors. I've seen so many family-style breakfast dishes around, most of which contain tons of bread, cheese, and processed foods. While that may be perfect for some, I like to start my morning off right with a healthy breakfast~ without sacrificing taste. 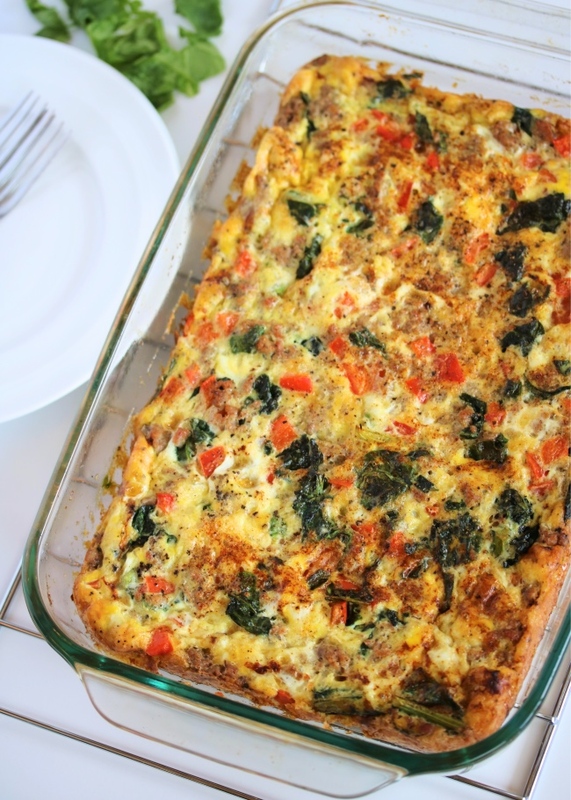 A hearty, tasty breakfast casserole dish doesn't have to be packed with gluten and dairy. Each of the simple ingredients in this recipe brings amazing flavor, and eliminates the need for 'extras'. Feel free to use this recipe as a guide, and substitute your family's favorite meats, vegetables, and spices. I think a ham & broccoli combination would be awesome! In a large skillet, cook the pork breakfast sausage over medium-high heat until browned. Add the spinach, kale, and bell pepper, and sauté for an additional 2-3 minutes to slightly soften the vegetables. Stir in any optional mix-ins you like. Coat a large baking dish (mine was 9" x 12") with cooking fat, and pour the sausage and vegetable mixture in, spreading it evenly along the bottom. 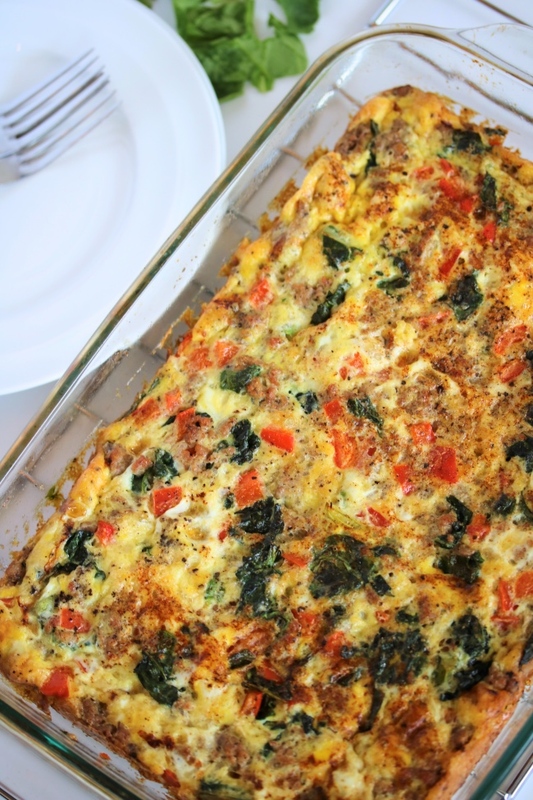 Whisk together the eggs, milk, salt, pepper, and garlic in a bowl, and pour the egg mixture over the meat and veggies. Bake for about 30 minutes, or until eggs are set & a toothpick comes out clean. *If you're making this on a Whole30, double check your sausage & dairy-free milk for no added sugar or other fillers/preservatives. I used the pork breakfast sausage from Butcher Box, and canned "light" coconut milk. Slow Cooker: Follow the same steps using your slow cooker. Prepare the night before & cook on low for 7-8 hours, or high for 4 hours (until eggs are set). Egg Muffins: Follow the same steps using a muffin tin (you made need more than one muffin tin). Fill each greased cup with sausage & veggies, then pour egg mixture over top. Bake at 350ºF for 25 minutes (until eggs are set). This looks delicious. I've been looking for a healthy breakfast option that feeds a large group. What would happen if you put it in the crockpot on low before you went to bed... and then woke up over 8 hours later? Also, do you layer this in the crockpot the same way you would in the oven? Yes mam, I would do everything the same as in the oven. & typically the crockpot automatically switches to "warm" mode once the cook time is over... so that should do it if you oversleep! Looks yummy! I was wondering if it would last 3 or 4 days in the fridge as that's how long it would take us to eat it. Or could it freeze? Normally reheated eggs are yuck but maybe it's different in a casserole? P.S. We had your all american chili this week and loved it!! Hey, thanks so much for letting me know. It looks like I've got it here one my blog, just left it out over on their site. Thanks for the heads up! Thank you for this recipe! 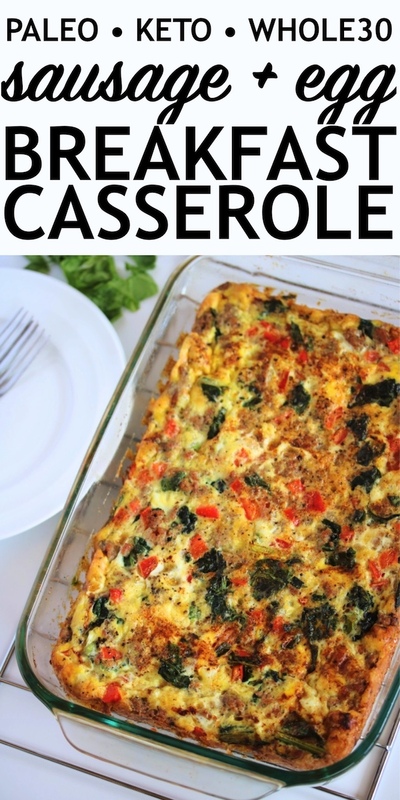 I used it to make two casseroles this morning for a breakfast party. I used the recipe for one as you have it (it was delicious) and mixed Ortega chiles and cubed ham in the other. Thanks again! Just made this for Mother's Day brunch. I was looking for a cheese free recipe as I am lactose intolerant, but unfortunately cheese always seems to be a major component of many egg casseroles. It was DELICIOUS! And all the cheese eaters loved it too. Thank you for such a great recipe! Has anyone made this in the crockpot, how did it turn out? Can you double it in the crock pot? My housemate is in the paleo diet and we try to eat some meals together. I tried this and we both loved it. Since there is only two of us I made a smaller amount. 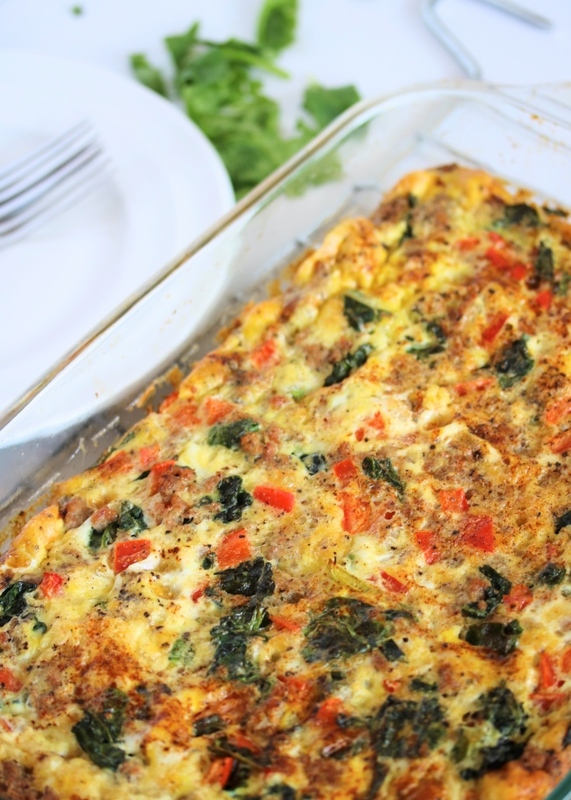 Neither of us really like spinach or bell peppers but loved them in the egg bake. Thank you for posting this. Hi Jessie! I just wanted to let you know this recipe is a staple in our house for when we have overnight guests. It's so easy to make the night before for a stress free yummy breakfast. Do you use bulk sausage or links? If kale won't be used, would you double the amount of spinach or add something else? Plan to make it tomorrow...thanks! We're going to make this for Christmas tomorrow - thanks so much for the great-looking recipe!! !